As many of you have experienced first hand, Steam sales have an enthralling power. When classic high-quality games go on sale for less than a deli club, I have serious trouble resisting spontaneous buys. Thus, when I saw Vampire the Masquerade: Bloodlines for just five dollars, a game that has earned a minor cult following and a great deal of critical praise well after release, I took the first opportunity to purchase it. 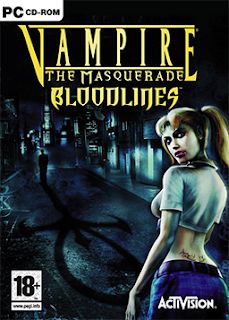 Developed by Troika Games and released in 2004, VTMB suffered from numerous bugs upon release. While many of these technical problems have been fixed, many still exist today. In my effort to overcome these issues and create a better play experience, I am tempting myself with power a player should never have. After installing VTMB, my first goal was to install the “Unofficial Patch,” a community made collection of improvements that address a vast amount of bugs plaguing the game. In my pursuit of home-brewed fixes, I happened upon a fairly rich selection of player generated mods. Some offer new quest lines, others gameplay adjustments or character re-skins. If I so choose, I can make the background NPCs more appealing or re-texture bland environments. The older a game is, the more intrigued I am at the prospect of breaking its rules. Surely we have all felt, at one time or another, the temptation to bend a game to our liking. Justifying game adjustments demands an assessment of the developer’s intent. Vampire’s unofficial patch repairs serious flaws that Troika never intended to appear in the game. Perhaps they would have also approved of the addon I installed to improve NPC eye textures, giving their characters a more realistic and alluring look. Would enhancing the game's diner environment be going to far? What about modernizing character outfits? The line between cheating and simply “adjusting” game elements is thin. At one point while playing VTMB, I encountered a bug that locked me behind a gate that needed crossing. In order to pass the barrier, I opened the console tool and turned on noclip mode, allowing me to move through the game’s geometry. Once the console was open, I could do almost anything with the game. Unsatisfied with Vampire’s ranged combat mechanics, I gave myself experience points to make up for wasted points allotted in firearms. While stuck in a particularly difficult warehouse, my skills not high enough to overcome my situation as stealthy as I wished, I turned on notarget, making me invisible to the enemies I effortlessly slipped behind and finished off. Alright, I’ll admit I cheated, and here is why:VTMB is almost a great game. Within the first two hours of play, I knew it offered something special. Unfortunately the best parts seem buried beneath frustratingly unpolished mechanics. I am trying to resist the urge to abandon normal play entirely, making my character a minor deity amongst vampires, but the temptation is strong. While I feel comfortable making the game my own, with too much power in my hands, I may end up sacrificing a meaningful experience in pursuit of a better game. I cheated the first couple of times I played through it. On my most recent playthrough, though, I used no cheats and somehow, finally, 'got' it (although the final battle is stupid, requiring a quite specific build - odd for a game that for the first two thirds let you play basically however you wanted). If you cheat during the tutorial, a dialogue is triggered with Jack where he angrily suggests you need to do some 'restrategising'. One of the responses is, "What? You don't like that I cheated my way to these stats?" The game breaks the fourth wall to give you an internet-troll-like "lern2play" comment. I'm not sure what I think of that. In some sense it's insulting, because learning to play Bloodlines is a fair bit more of an effort than most games (like I say, it took me three playthroughs), but on the other hand when you learn to play properly it is very rewarding - for the first two thirds of the game, at least. Perhaps this is a difficulty inherent in creating games that cater to different playstyles: It's difficult to get them to reward you for doing it right, so you're never quite sure if you are doing it right, and so, in turn, it's harder to learn how to do it right. And that's when the temptation to cheat comes in. I bought this on a Direct2Drive sale before I realized that Steam was awesome. I played a good chunk of it, and loved it - but the broken-ness eventually overwhelmed my desire to keep playing. I didn't even think about cheating - I thought that stopped being cool when my Game Genie broke - but if I ever work up the will to go back to VTM, I might have to employ a little console-fandangling myself. It's like a meta-game! I think you're on to something with the playstyles thing. I felt I was playing Fallout 3 incorrectly and would have gladly "cheated" to make it a more entertaining game. I recommend you go back and try again with a few cheats in hand. Also, I too was a proud Game Genie owner. Good times. First off, I would like to point out that, even in its broken-arse state, Vampire: the Masquerade - Bloodlines is still in my top three favourite games of all time; it holds this esteemed position along with Deus Ex and Morrowind. I managed to complete the game entirely without cheats, with the exception of using the console to get past the glitched out boat in the caverns (on release, I don't believe there was any other way around that particular stumbling block, though it has been rectified in the subsequent patches). I agree that there are some play-styles that the game made difficult, though I was pleasantly surprised to find out that the "High-Charisma-Diplomatic" route was very well done. Games of that time period simply did not give you diplomatic ways out of potential combat situations, and so I was very happy that I could play my Toreador in the fashion that I had longed for. As for the concept of "cheating", this is a realm I try and steer clear from as often as possible. The biggest problem with cheating is that, once you break your resolve, it is a very slippery slope and a long way to fall. It starts off with a slight tweak of your stats to make a situation slightly easier (or more tolerable), but then what is the difference between giving yourself a +1 and a +2? I mean, it is such a small numerical difference, right? Then, if it is so small a difference, why don't I just give myself two +1's to two different stats? Or maybe a +2 and a +1, right? Since you have already cheated once, doing so a second time all of a sudden becomes something trivial and small. This said, in today's era of "Cheap Steam Games", and particularly access to legacy games from a decade ago, we now can easily end up with a list of games to play that is so large, you simply could not have enough time to complete them all. So often in these games, I will find myself cheating just to get through the grind of an old game. It is like having a "casual" setting on the difficulty slider, for when you just want to consume the story as quickly as possible and move on. However, this begs the question, what is the difference between a game that you just want to consume quickly, and a game you want to savour? I didn't know about that Easter Egg(?) with Jack, but now that I have gone back and seen it, I -LOVE- it! :D I totally dig that the game is giving you a rap on the knuckles and letting you know that it won't be pushed around without a fight! <3 you Smilin' Jack! Seriously mate, what Jorge said. Go back and give it a shot, but try not to ruin the experience with -too- much cheating. This game has so much to offer if you try and play it right.